Are you looking to go deeper into the mysteries of Yoga? Do you yearn for peace, tranquility and a chance to practice Yoga in one of the world’s top luxury travel destinations? 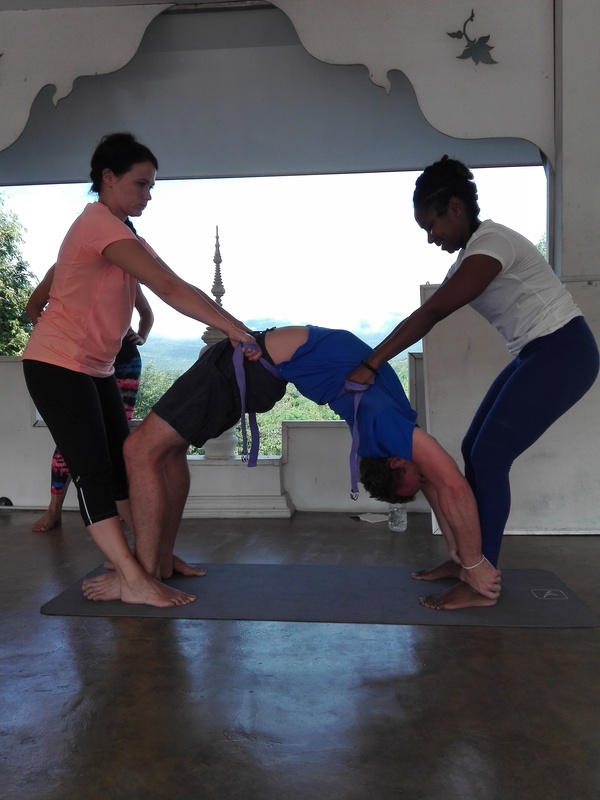 Then Yoga Teacher Training Thailand offers a chance to experience ashram living surrounded by the Northern Thai Mountains and lush green jungle. 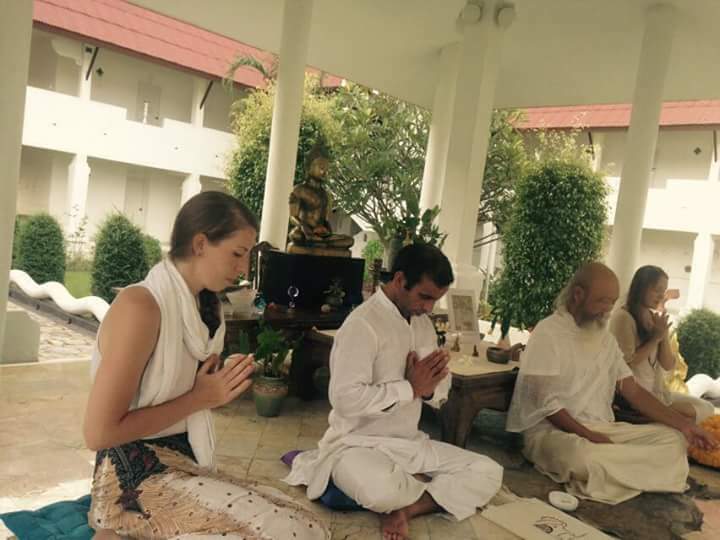 Yoga teacher training Thailand offers an opportunity to immerse totally into the yogic way of life. What better way to connect with the deep science of yoga than to experience it in totality. Thailand, is famous for its hospitality, often referred to as the ‘Land of Smiles’. The Thai people know how to enjoy life and welcome tourists readily. This makes Thailand a top destination for all kinds of travelers. Thailand has a colorful and rich culture; Buddhism travelled over from India and mixed with the diverse local ethnic minority influences creating an eclectic mix of artistic, cultural and spiritual influences. This led to Thailand’sarray of elegant palaces, temples and architecture throughout the country. 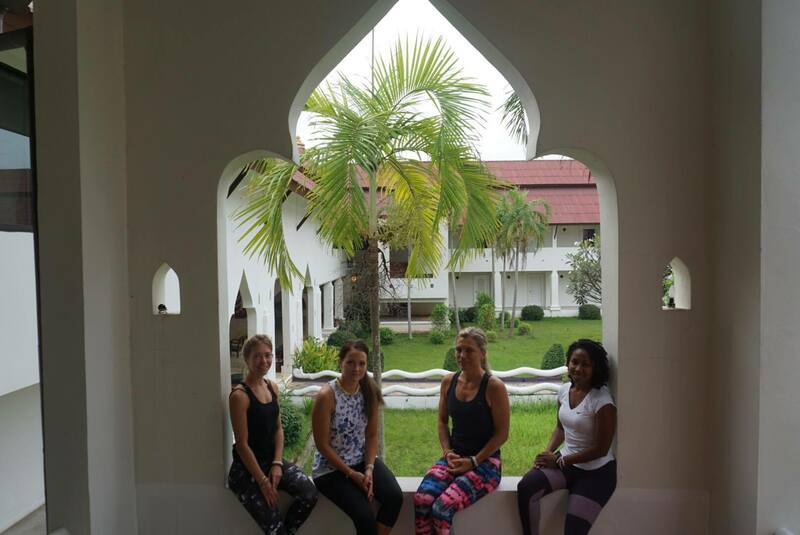 Thailand’s natural landscape is breathtaking,It has everything to offer from lofty mountains, lush green rice padi fields, white sandy beaches and long winding rivers.Yoga Teacher Training Thailand is an exciting luxury yoga destination, perfect for relaxation, exploration and adventure. For complete pricing list see here. 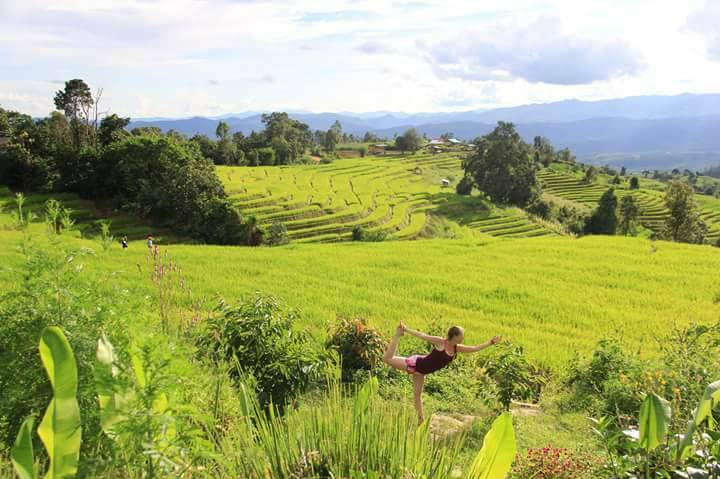 Yoga teacher training Thailand is located outside the city of Chiang Mai. This cosmopolitan city in Northern Thailand holds the entrance to the national parks in the mountainous Northern region of Thailand. This area is combines ancient Lana culture, breathtaking natural beauty, and cultural influence of minority hill tribe villages hidden in the vast mountain ranges. 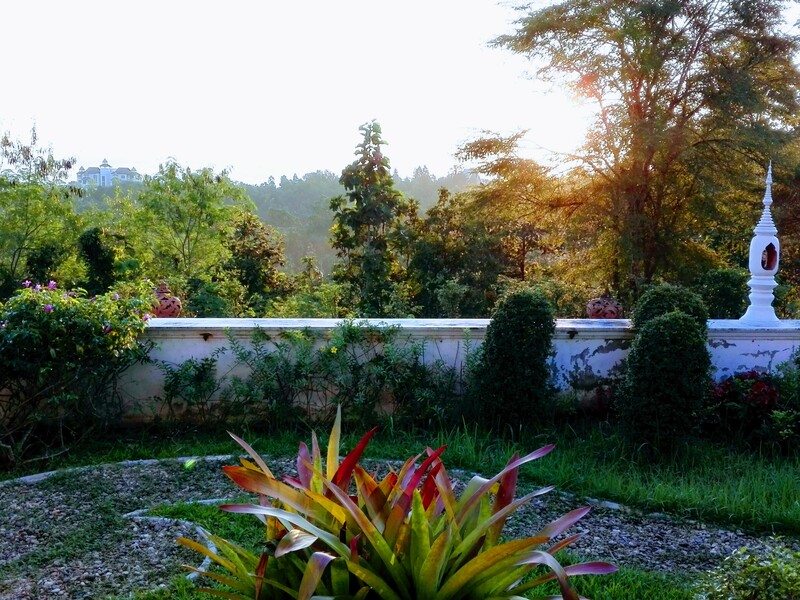 Chiang Mai offers the perfect setting for our Yoga teacher training Thailand. 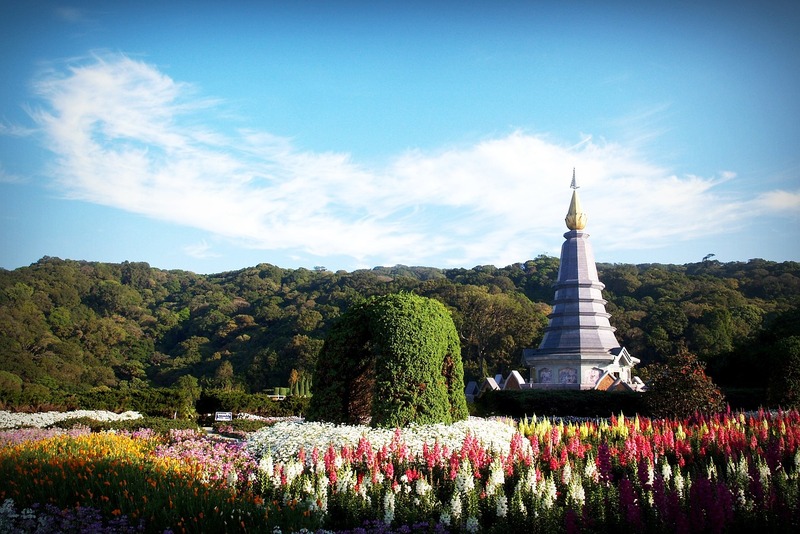 Chiang Mai City is famous for its high living standards and diverse cultural scene. Chiang mai offers a balance between traditional Thai culture and modern city life. At the city hub is the ‘Old City’ the ancient Lana city surrounded by red bricked walls and water filled moat. The Old City oozes character and charm. Whilst Chiang Mai attracts many tourists there is still the possibility the wander through the small winding back streets finding quiet residential areas and small temples; little sanctuaries form busy city life. In this central hub there, are a variety of famous markets ranging from traditional food markets to artsy handmade pieces and old antiques. Chiang mai’s most famous market happens every Sunday when traffic is stopped and the Sunday Market sprawls from its center at Thapae Gate. Famous for its arts, Lana crafts and wonderfully delicious local delicacies this market is an ideal place to get lost for hours. Chiang mai is also the place to come for Thai massage dubbed Yoga for lazy people, due to the yoga like positions. Excellent massage schools where you can learn the techniques and luxury spas for an indulgent massage are abundant. Another highlight of the city is its array of healthy foodie hangouts. Famous for its Thai food and healthy clean, organic food stalls, 5 star restaurants and busy markets serving up traditional Thai cuisine for the curious traveler. What better way to enjoy a Sunday after an intense week of yoga practice, than to relax with a massage and a healthy delicious meal. Fringing the Old city is a modern cosmopolitan hub. Featuring modern shopping malls and quirky Thai coffee bars favourited by the cities student population. Edging this lively city is a sea of lush green paddy fields, deciduous rain forest and brilliant mountain ranges. Within 20 minutes journey by bike or bus you can explore the nature. Adventuring through jungle to local hill tribe villages where the only noise you will hear is bird song. 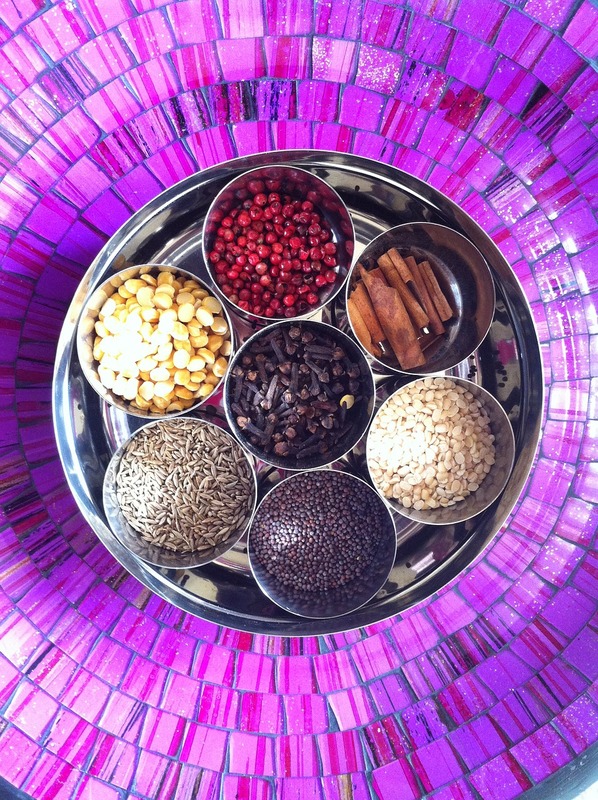 The yoga teacher training Thailand course takes place in the Amazing setting of a luxury Ayurvedic Ashram. 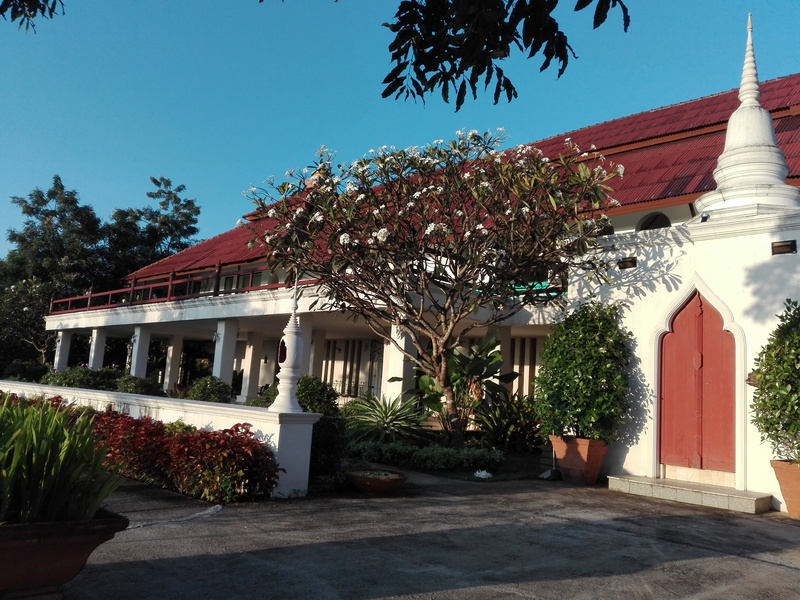 The Ashram is situated 20 minutes drive outside Chiang Mai city on the outskirts of the national park. Accommodation is high standard ashram living. Each single room has an on-suite bathroom with hot shower, delicate Thai decor and big double bed. If you feel like a little more luxury we offer a choice of the deluxe option which includes a suite. Or if you wish for a more budget friendly simpler option we offer the shared twin room option. The Ashram building is a Vedic Ashram. Meaning that every detail has been carefully considered and laid out for the most auspicious atmosphere. 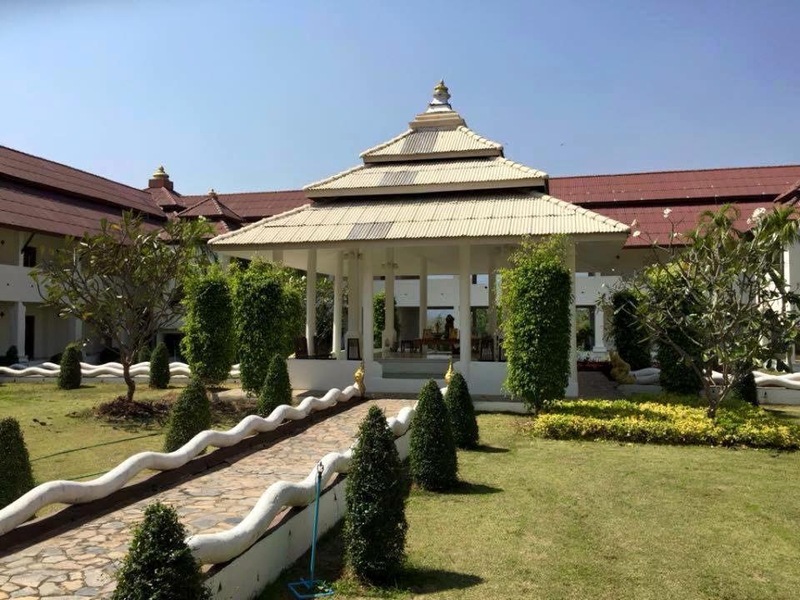 The building is decorated in the traditional Thai manner with open air, pristine gardens inside its walls and beautiful handcrafted architecture and murals depicting yogic scenes and ancient Thai stories. The infinity pool in the lower gardens looks over the forest, and is the perfect place to spend break times. The yoga ‘shala’ or studio is on the second floor, open on the sides to allow for the cooling breeze to enter. It has views over the mountains and the ashram grounds. At the center of the ashram is a pagoda surrounded by carefully kept gardens and there is even the option for outside classes in these grounds. There is a meditation room, relaxing areas around the building and outside, dining hall and veranda. The location is absolutely tranquil, surrounded by nature, but within easy reach of all amenities in the city. 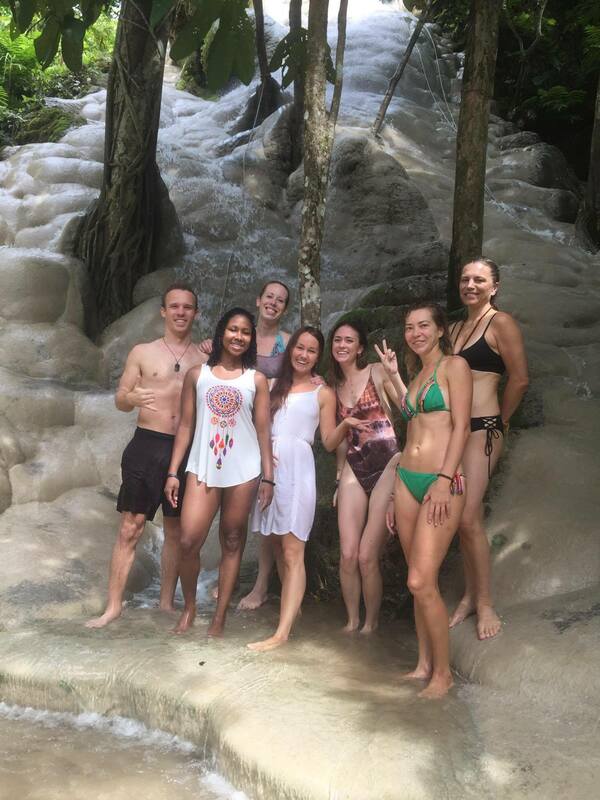 Here you peace is easy to find and this atmosphere helps any yoga teacher training Thailand student absorb the essence of yoga. Yoga teacher training Thailand has its own cafeteria only for the use of students and teachers. 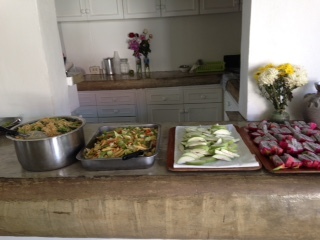 The Chefs prepare Vegetarian yogic food freshly. All meals are nutritionally designed to provide our students with all their body needs as well as detox the body. 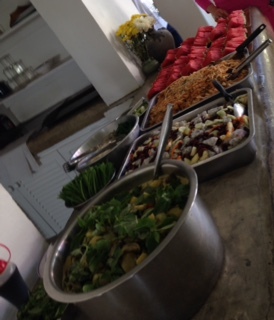 Food is served on site in the dining area at the Ashram. Accommodation is high standard ashram living. Each single room has an on-suite bathroom with hot shower, delicate Thai decor and big double bed. If you feel like a little more luxury we offer a choice of the deluxe option which includes a suite. Or if you wish for a more budget friendly simpler option we offer the shared twin room option. We provide a onetime sightseeing tour one day of the weekend. We are able on request to arrange taxis for the students to leave for the whole day all together on Sundays- There must be a prearranged time and pickup point.